John Pule was born in Nuie. During the 1970s his family settled in New Zealand as part of the Pacific Island migration flow seeking employment. As a result he sees himself as an outsider to both cultures; caught in a dichotomy between contemporary European New Zealand and traditional Niuean culture. Pule’s themes arise from his personal world, his local environment and the cultures he lives between. 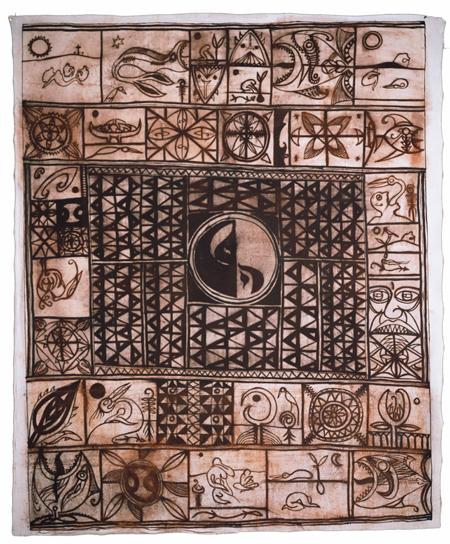 In Mamakava he comments on the appropriation of the physical landscape, using the earthy tones and motifs of traditional tapa cloth to creative a subversive effect. He unsettles conventional representations of a Pacific paradise by interweaving traditional images of flora and fauna with industrial or barren landscapes. The landscapes may contain figures and it can be difficult to determine whether they take postures of mourning, celebration or prayer. Through his work Pule attempts to counter stereotypical images of the Pacific by subtly addressing current political issues about people, their communities and beliefs.